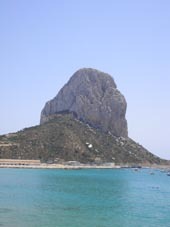 Calpe guide, holiday rentals, property, map, weather, hotels, car hire, airport transfers, golf. Location:- Situated on the Northern Costa Blanca coast between Altea and Javea the popular holiday destination of Calpe and can be accessed from the N332 or the AP-7 Autovia. Overview:- For many centuries just a small fishing village, Calpe is now a renowned holiday destination, notable for its astonishing rock formation, known as the Penon de Ifach, which looks down on the town, port and marina. Calpe has a resident population of about 22,000 with something like 50% of non-spanish nationality, expressing its significance as a place for relocation and relaxation. Climate:- Calpe Weather - Calpe has a warm and temperate climate with an average annual temperature of around 20° C. Temperatures range from a low of about 5° C in the winter to highs reaching 40° C in the summer months. Calpe enjoys over 300 days of sunshine each year making it an ideal location for holidays all year round, evening temperatures can be a little cooler during the winter months but daytime temperatures remain pleasant all year. Calpe History:- Calpe Spain has a long and fascinating history and has been occupied over the centuries by Iberians, Phoenicians, Romans and Moors. The Romans incorporated a fish salting factory in Calpe in the area of Los Baños de Reina, close to the current promenade, and the Arabs built the ancient Castle of Calpe, from which they defended Calpe until defeated in about 1240 by the Christian forces of the Conquistador King Jaime I. A tiny town known as ‘Ifach’ was fabricated on the slopes of the Peñon de Ifach in around 1290 by an Aragon Admiral (Roger de Lauria), and later the walls were strenghtened and fortified by King Pedro II, to defend the town from attacks by morisco (Barbary) pirates who sailed these coasts for many centuries. The tiny town of Ifach was eventually destroyed in the War of the Two Pedros (1359), and the former inhabitants fled to a nearby farmhouse, which overlooked the Bay of Calpe, it was in the area around this farmhouse that present day Calpe grew and developed. This newly emerging town also constructed a fortified wall to fend off pirate attacks, though it continued to suffer frequent incursions. In 1659 Calpe Spain suffered seriously when the town was sacked and looted, and almost three hundred of its inhabitants were taken to North Africa (Algiers), where they were incarcerated for five years or so, until exchanged for some gold and the release of a number of pirate prisoners. During the 17th Century an increase in population resulted in a number of Calpe's inhabitants having to live outside of the town's walls and during the 18th Century several projects were undertaken to extend the town walls in order to contain this growth. This growth continued into the 19th Century at which time there was a considerable increase in the marine activities of the town - fishing and related industries became more important, also the production of salt. In the 1930's a small tourism industry developed, as the first beachside hotels were built to provide holidays for the emergent middle-classes. Growth of the tourism industry continued in Calpe throughout the 1940's and 1950's and accelerated rapidly in the 1960's as it did along the whole of the Costa Blanca. Agriculture (almonds, raisins and carob beans), fishing and salt production have been the mainstays of Calpe's economy up until the emergence of tourism which has now taken over as the main money earner. Places to Visit:- There is plenty to see and do in and around Calpe, everyone will without doubt want to visit the breathtaking Penon de Ifach rock formation, nowadays a protected Natural Park, it was formerly used as a watchtower from which the people of Calpe could spot raiding Berber pirates. It is now possible for visitors to reach the top of the 330m high rock (a tunnel was dug in 1918 to make the climb easier) and thus enjoy stunning views of Calpe and the coastline. The number of people allowed on the Peñon at any one time is however restricted - so it is advisable to arrive early particularly during the busy months. Also worth visiting are the fishing port, the Archaeological Museum, the Festival Museum, the Hermitage of San Salvador, Mariners Square. Not too far way is the slick tourist resort of Benidorm with its many fine facilities, entertainment and attractions, also Villajoyosa with its pretty coloured fishermens houses and chocolate factory. Fiestas:- March - and Feast of Saint Joseph, June 24th - the Midsummer's Festival, August 5th - festival La Virgen de las Nieves, Calpe's patron saint, with fireworks and outdoor parties, 21st - 24th October - The Moors and Christians festival. Beaches:- Calpe Beaches - Cala Morelló - sandy, Playa Cantal Roig - sandy, Cala La Manzanera - pebbles, Cala Calalga - pebbles, Playa Puerto Blanco - sand and pebbles, Cala El Racó - pebbles, excellent for diving and fishing. Nearby Resorts: Nearby towns and resorts include Denia, Benissa, Moraira, Cumbre del Sol, Javea, Teulada, Benidorm, Alcalali, Parcent, Altea, La Nucia, Xalo, Albir, Lliber and Gata de Gorgos. Churches:- Parish Church of Nuestra Señora de las Nieves (Iglesia Parroquial de Nuestra Señora de las Nieves), the Old Church (Iglesia Antigua) from the 15th Century. Gastronomy:- The cuisine of Calpe is traditionally based on rice and fish and it is a great place to try one of the many types of paella. Calpe is also well known for a traditional fisherman's dish known as 'Llauna de Calpe' which is a type of fish stew containing mixed fish, garlic, olive oil, red pepper, parsley, saffron, salt and water. Calpe is located in the Alicante province of the Comunidad de Valencia (autonomous region), on the Northern Costa Blanca coastline between Altea and Javea and can be reached via the AP-7 motorway or by the N332 coastal road. Calpe airport driving distances: Alicante airport to Calpe is a driving distance of 82 kilometres (51 miles), Murcia airport to Calpe is a driving distance of 161 kilometres (100 miles), Valencia airport to Calpe is 129 kilometres (80 miles).